A committee of Mars Society staff members took a close look at nearly two dozen creative designs submitted to the 2017 Mars Society Poster Contest. After a longer than expected review period, the winner of the annual competition was selected – Violaine Bourgeais (France). 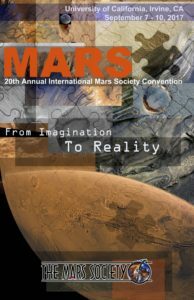 Graphic artists were asked to submit a poster using the theme “Mars: From Imagination to Reality” for the 20th Annual International Mars Society Convention, set to take place September 7-10 at the University of California Irvine. As usual, the winning design will be used by the Mars Society to help promote its four-day space conference. With submissions received from around the globe, the organization also announced the second and third place winners of the contest – Jennifer Claudio (U.S.) and Ed Sludden (U.K.) respectively. The Mars Society would like to express its appreciation to all of the talented participants in this year’s contest. For more information about the 2017 International Mars Society Convention, including registration details, please visit our web site.